The Bulldogs proved their ability to give the hometown crowd a show this past weekend with their decisive wins over conference rivals St. John’s and St. Thomas. UMD wrapped-up the regular season by securing the #1 seed out of the UMLC-West heading into the conference tournament. Home field advantage is not something the Bulldogs can take advantage of often. The lack of indoor facilities in Duluth means home games must be played at alternate locations until the snow is plowed off of Griggs Field, usually in late March. This didn't stop UMD from feeling right at home as they took the field on Thursday and Saturday nights. 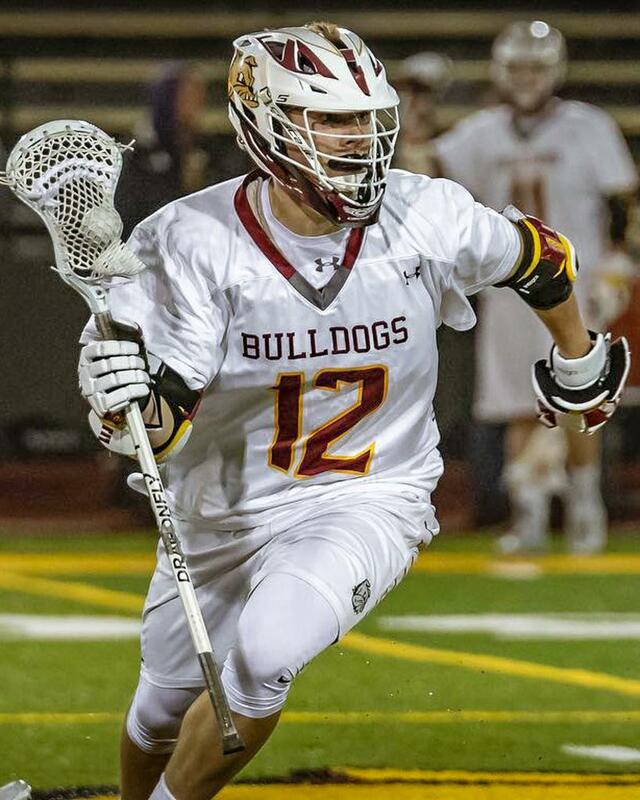 The Bulldogs fed off the energy brought by the many students, local lacrosse fans and parents, and used it to put on a top tier performance. On Thursday, April 4, UMD had a long day to get ready for their 9:30 p.m. start against the Johnnies. By the time the Bulldogs took the field, the sky was dark and there was a light snowfall. UMD got off to a slow start, going down 3-1 early in the first quarter. The team remained composed turned it around quickly. The Dogs scored seven goals in the second quarter and by halftime, the score was 10-4 for the home team. The game evened out after halftime with UMD scoring five goals to the Johnnies’ four. The final score was 15-8. Junior midfielders Ryan Larson and Marcus Olson played big roles in the win, scoring a combined seven goals. The defense also came to play, shutting down the majority of Johnnie dodges. Josh Hutunen rolls through a St. Thomas defender. Marcus Mondo clearing the ball. Less than 48 hours later the Bulldogs were eager for their 7 p.m. matchup against their newfound rival, the St. Thomas Tommies. The temperature was in the mid-30s but that didn’t stop the hundreds of fans who came out to see some of the best lacrosse the region has to offer. They certainly were not let down when Jake Pitts scored the opening goal just minutes into the first quarter. The UMD offense again did the majority of the work in the second quarter, putting in four goals for a score of 6-3 UMD heading into halftime. While fans caught UMD Lacrosse t-shirts and pinnies, the Dogs discussed how they would grow their lead in the second half. The defense played a crucial role in doing so. 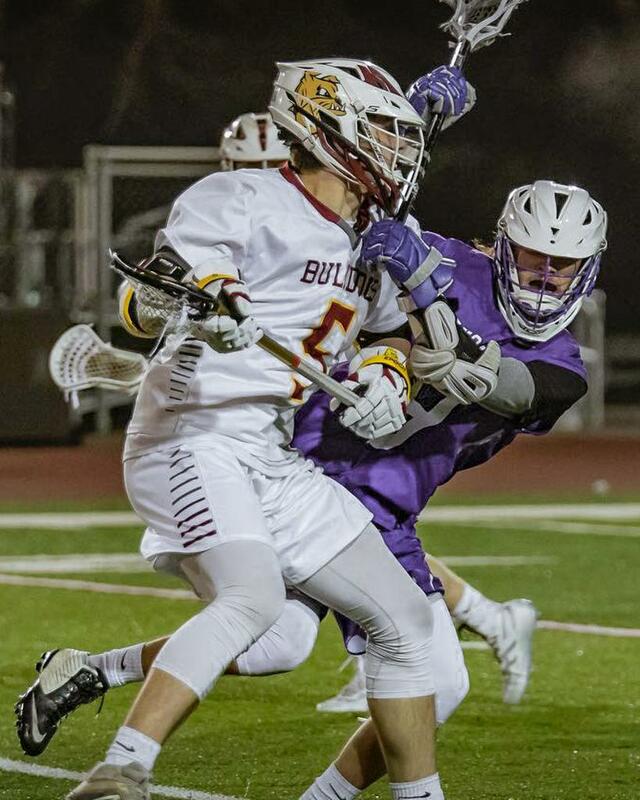 Long poles Noah Olson, Jeff Rounds andAaron Ajke shut down the Tommie attackmen, while D-mids Colin Joyce, Marcus Mondo, and Kraig Urquhart won their matchups. Blake Nastrom had 19 saves and only one goal allowed in the second half. The final score was a decisive 11-4 UMD victory. This win meant the #1 seed out of the UMLC-West was clinched for the Dogs, having beat NDSU and now St. Thomas. This secures a first-round bye in the UMLC tournament, which will be held the weekend of April 26 and 27 in Crown Point, Ind. The Dogs will play either NDSU, Dayton, or Grand Valley State in the second round.